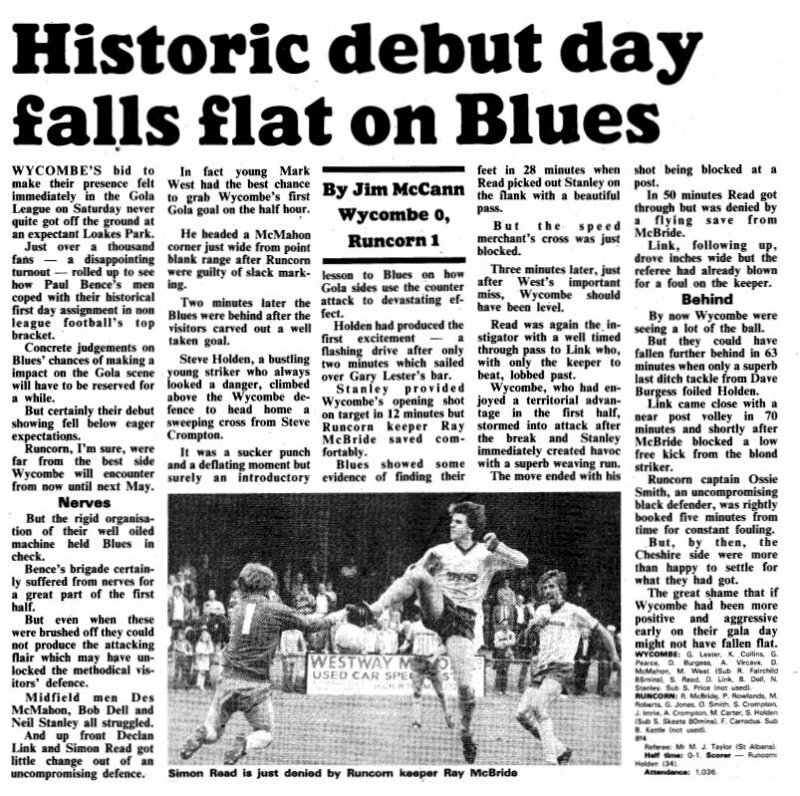 A crowd of only just over 1,000 were there to see it but Saturday 24th August 1985 goes down as an historic day in the story of Wycombe Wanderers. The visit of Runcorn in a 'Gola League' match at Loakes Park was the first ever national League game for the Wanderers in what was close to their 100th year in existence. A third place finish in the Isthmian League the previous season had finally given Wanderers the chance to compete with the elite of non-League football for the 1985/86 campaign and trips to the likes of Altrincham, Telford United and Kettering Town were, at the time, eargely awaited by what had become a fairly dwindling support for the premier football club in High Wycombe. Average League gates at Loakes Park had dropped to just over the 500 mark and the move to the increased spotlight of the 'Gola League' was seen by many as the chance to revitalise the interest in the Club. The match ended in a 1-0 defeat for the Wanderers, Steve Holden heading home the only goal of the game from a Steve Crompton cross on 34 minutes. Minutes earlier, locally born youngster Mark West, signed the previous season following his release from West Ham, had Wycombe's best chance of the game - heading a Des McMahon header wide from close range. Wanderers route to national football: The 'Gola League' had been formed as the Alliance Premier League for the 1979/80 season and took its original membership of 20 clubs from those previously competing in the Southern Premier League and Northern Premier League. The organisers were criticised by some for omitting selection of the previously amateur Isthmian League clubs. However, at the end of the 1980/81 season two Isthmians were invited as the Alliance Premier expanded to 22 clubs. Champions Slough Town turned down the offer but 2nd placed Enfield said yes. Wanderers had finished 3rd but said no. It was left to Dagenham who had finished 8th to take the other place on offer and make the ambitious step to become the first Isthmian League sides to go national. Neither side had many regrets. Enfield finished as runners-up to Runcorn in their debut season and The Daggers took 5th spot, proving that Isthmian clubs could compete at this level. But still Wanderers showed little ambition in seeking promotion - finishing 3rd again in 1981/82 and declining promotion after Champions Leytonstone & Ilford and 2nd placed Sutton United opted out too. Wanderers went on to claim the Isthmian League Championship at the end of the 1982/83 season but turned down promotion again. The same season Enfield took the Alliance Premier title but were denied the chance to apply for election to the Football League because their ground did not comply with Football League regulations. The following season Wanderers finished 7th in the Isthmian League and Champions Harrow Borough continued the unhealthy trend of Isthmian sides not taking the opportunity to take promotion to a League now under the sponsored title of the 'Gola League'. 1984/85 (thought at the time to be Wanderers Centenary season) saw Wanderers have a slow start to the season under new Manager Paul Bence. By November 1984, Wanderers were in 15th place in the table and had been knocked out of the FA Cup at the 4th Qualifying stage for the first time in 12 years after losing in a replay to a Burton Albion side managed by Neil Warnock. However, a 17 game unbeaten run in the League has seen Wanderers jump to third spot in the table by the time a shock annoucement was made in April 1985 that the Club had applied for membership of the 'Gola League'. GOING FOR GOLA was the headline splashed across the backpage of the Bucks Free Press. However, to meet the new ambition of promotion Wanderers still had to finish in the top three to be eligible for promotion. Then leaders Sutton United had already stated they wouldn't be applying for promotion, while 2nd placed Worthing had issues surrounding the ownership of their ground (during a season that saw the Bradford City fire tragedy, Worthing were also later completely ruled out when their main stand was destroyed by fire). 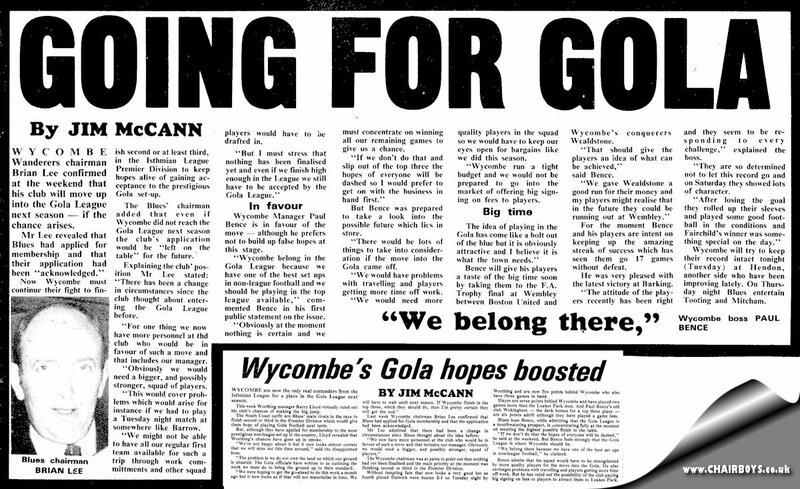 It was left for Wycombe to eventually fight off the challenge of 4th placed Wokingham Town to clinch 3rd place and promotion following a narrow 2-1 comeback victory over Croydon at Loakes Park on Thursday 2nd May 1985 - Declan Link bagging both Wycombe goals in a six minute second half spell to excite the 554 attendance. The 1,036 gate versus Runcorn was bettered on only one other occasion at Loakes Park that season - 1,068 watching the meeting with old Isthmian rivals Enfield. However, an FA Cup run that saw Colchester United beaten at home before a 3,000 plus crowd and a FA Trophy run that ended in a 4th round defeat at Kettering, made for an incident filled campaign. But Wanderers' first season competing at a national level would end in disappointment as Paul Bence's side managed to pick up just two points from their final six games (conceeding 17 goals in the process, including a bizzarre Graham Pearce own-goal to condemn the side to a home defeat to Altrincham). Relegation back to the Isthmian League was confirmed on Sunday 4th May 1986 when Runcorn, playing Altrincham in the FA Trophy final at Wembley a fortnight later, contrived to draw 1-1 at home to Wanderers' nearest relegation rivals Dagenham. The Daggers goal coming after just a few minutes after a hopeful punt forward had bounced over 'retired' Linnets 'keeper Peter Eales and into the back of the Canal Street net. It was a huge blow for Wanderers but one that seemed to spur the Club on as they bounced back in style during a hugely memorable 1986/87 season.